In the month of May we taught the children how to say basic body parts and face parts in Japanese. The children learnt how to say basic body parts such as “ATAMA(head)”, ”KATA(shoulders)”, ”HIZA(knees)” and ”ASHI(legs/toes)”. They also learnt basic face parts such as ME(eyes), MIMI(ears), Hana(nose) and KUCHI(mouth) in Japanese. To naturally memorise those words, we played some games such as “Hoshi ga tommata (The star land on—) game”, “matching game/dice game”, “coin game” and “Doctor doctor game”. 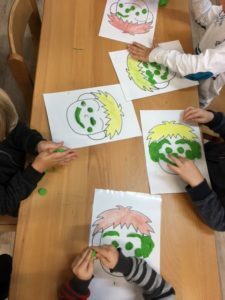 The children enjoyed those games while practicing body parts in Japanese. While singing “Hoshi ga Tomatta game”, the children did their best to put the little star on their Atama (head), Kata (shoulders), hana (nose) and so on. Also we sang a song called “Atama Kata Hiza pon! (Head, shoulders, Knee and pon!) song. This is the one of children’s favourite songs and they sang it using body gestures. Even the Junior kindy or some Toddler children sang and enacted it out so well! All of the children loved this song when they sang it both fast and slowly. We played a “Fukuwarai(making funny face) game”. The Junior Kindy children pulled some hilarious faces and the preschool children did some with eye masks on! It was s much fun to watch. We also made face parts with playdough. Using their imagination, the chidlren made face parts in difefrent ways such as a little ball for ME(eyes) and HOHO(cheek) and long ones for KUCHI(mouth) and MAYUGE(eyebrow). The children absolutely loved the experience which helped with the development of their fine motor skills as well! 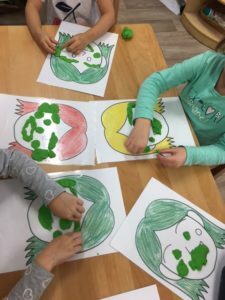 Through these activities, the children learnt not only basic face parts, but also extra face parts such as MAYUGE(eyebrow) and HOHO(cheek). We taught the children two direction words such as HIDARI (left) and MIGI (right). We introduced these words such as MIGI TE (right hand), MIGI ASHI (right leg) and HIDARI ME (left eye). We also sang the GU CHOKI PA song (rocks, papers and scissors song). While singing this song we made a butterfly, a crab, a snail, helicopter and so on, using our Migi-te and Hidari-te. That was fun! Japanese lessons have started for toddler children since April, and it’s been 2 months already! All the toddler children settled down and they enjoyed some songs such as “OHAYO song”, ”SAYONARA song” and “OTENKI song” while doing gestures with their little hands. Well done, Toddlers! We introduced the children May’s event called “KODOMO NO HI(children’s day)”.Children’s day (used to be called boy’s festival), takes place on 5th of May in Japan. On this day, we celebrate children’s happiness, their health and growth. Families with boys set up large sized carp streamers, called Koinobori outside of house. The carp streamers stand for strength and success. People often display samurai warrior helmets inside the house. Then they eat special festival food including Kashiwamochi (rice cake).Children’s day is the one of children’s favourite holidays in Japan. Before the event, all the children made own Koinobori art. They put colourful special stamps on as scales on carp fish and glued eyes on it while saying “ME(eyes)”. On the event day, the children sang many songs, enjoyed games, and magic shows. Some of the children tried making special helmets with newspapers, and they looked so cool! 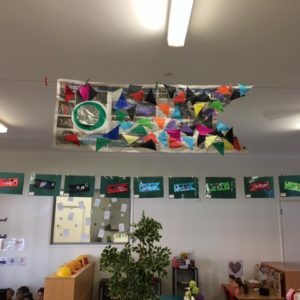 Each class also made a big Koinobori. 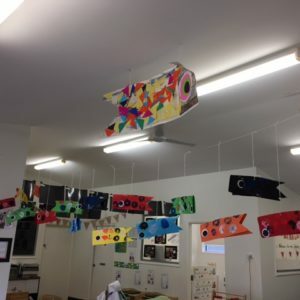 All the children put colourful paper’s scales on big Carp fish and they looked amazing. At the end, the children tasted Japanese pancake called Okonomiyaki. This was made by flour, eggs, sault, lots of cabbage and corn. Some of the children ate with sauce (Japanese mayo and special sweet sauce). It was yummy. And some of the children ate as plain. We were surprised many children liked it. Ofcourse some of them didn’t like it but they still had a chance of tasting different food. We wished all the children’s healthy growth and happiness! Miss Chie joined the Koolkids Open Day at Casuarina and Southport in this month. 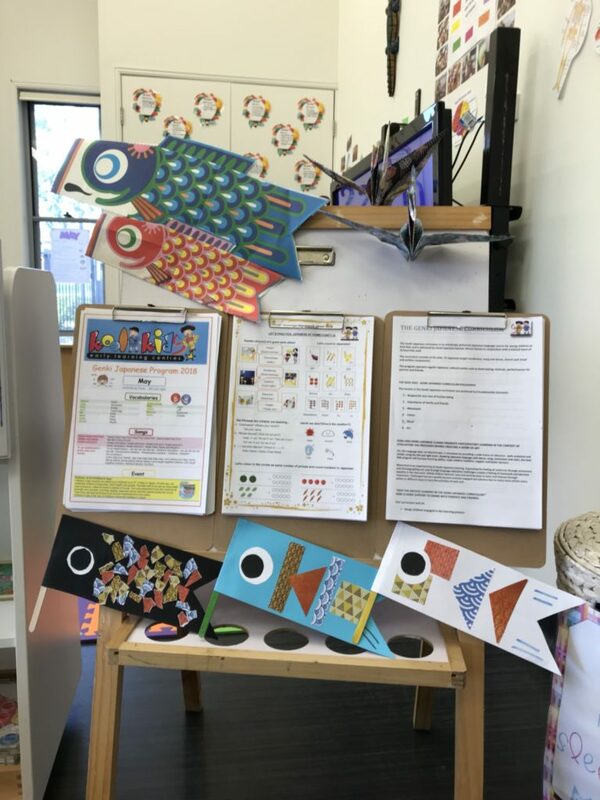 She introduced our Genki Japanese lessons and offered children Japanese craft activities, including the making of Koinobori(Carp fish which is symbol of Japanese Children’s Day). She also sang some Japanese songs at Casuarina. We would like to say a special thank you to all our lovely parents who joined and sang a song with us. We hope everybody who attended this event had a great day! Miss Chie also attended the Under 8’s day event with Koolkids Ashmore Centre at Trinity Lutheran college. This is a free community event and celebrates language and culture. We introduced the Japanese May event called Children’s Day and offered Koinobori craft. 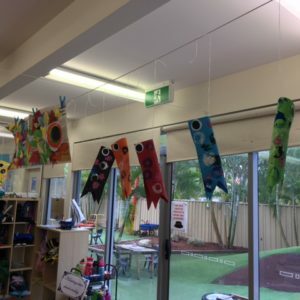 While making Koinobori craft, the children learnt some colours in Japanese as well. Miss Chie even sang some songs including teaching numbers in Japanese. Some of the children who are learning Japanese at their school were very good at singing those songs. In the month of June we are going to teach Unit 5, which is Emotions. We would really appreciate your involvement in Genki Japanese, and hope that you have ehnjoyed the activities that we have organised so far.